Ever since I posted my success with a natural tick repellent (see that post HERE), I’ve been getting tons of questions asking about a natural flea repellent or a natural flea powder. And I didn’t have any experience with any of the natural flea repellents out there so I couldn’t make any personal recommendations to you……until now. My big boy just turned 5 at the beginning of summer (isn’t he so handsome?!). And we’ve been blessed with not having any flea issues during those past 5 years. But at the end of April, we moved into an older house even deeper in the woods of Pennsylvania. And soon after we moved in, we discovered that it was totally infested with fleas. UGH! My poor buddy was being eaten alive by these nasty fleas. Ohmigosh, it was so horrible. I literally felt sick to my stomach watching him scratch and itch. His poor tail was raw, red and inflamed from him chewing on it so much. I absolutely hated the idea of putting any sort of toxic chemical flea treatment on my dog. 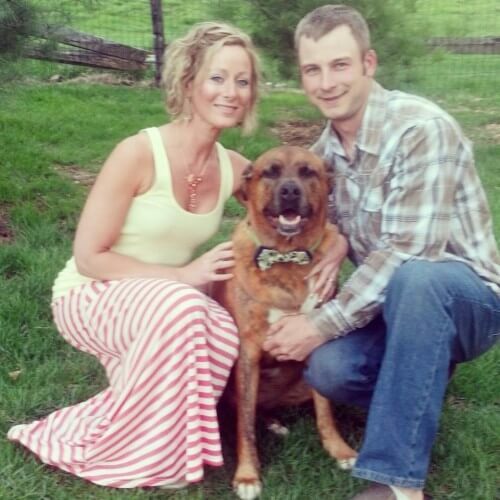 Those products are the #1 cause of pet poisonings. Did you know that on those commercial flea and tick repellents, there’s a big warning to not let it come into contact with human skin. So somehow it’s ok to put all over my dog?!! I don’t think so! I needed to do something and using toxic chemicals was going to be my very LAST resort. Once I realized that we had a pretty major flea problem, I broke out my holistic pet care books (THIS and THIS) and consulted with a holistic vet friend. And today I’m giving you my homemade flea powder recipe that I now swear by. 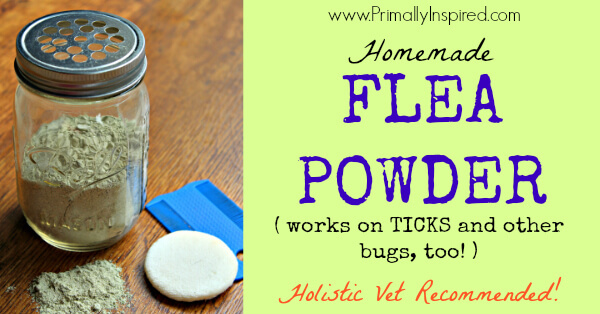 This flea powder worked at getting rid of a pretty major flea infestation in our home. And I didn’t have to use any toxic chemicals!!!! Bonus – this flea powder also works at repelling and killing ticks, flies, mosquitos, ants, spiders and other bugs. This is awesome stuff! *Note: If you don’t want to make this recipe yourself, you can buy Buck Mountain Parasite Dust HERE – I based my homemade flea powder off of this product. But it is much more cost effective to make it yourself, especially if you have a flea infestation because you are going to need a lot of it. This homemade flea powder is composed of Diatom Flour, Neem Powder, and Yarrow Powder. All e ingredients are traditionally used as very effective insect repellents and recommend by many holistic vets as a successful flea and insect killer and repellent. Diatomaceous Earth is soft powder made up of fossilized remains of tiny aquatic organisms called diatoms. Their skeletons are made of a natural substance called silica. Under a microscope, DE is very sharp, allowing it to puncture the exoskeleton of insects and causing them death by dehydration. Diatomaceous Earth kills insects by physical action, not chemical. It’s important to note that DE particles are so small so it just feels like a fine baby powder to humans and pets. It is a simply a mineral silica. Food grade, fresh water DE is harmless to humans and pets. For more information about the safety of food grade DE, see the end note at the bottom of this post. Neem is an herb used in Ayurvedic medicine. It has been used for centuries as a very effective herbal insect repellent, repelling fleas, ticks, lice, mites, ants and mosquitoes. Neem has a few natural active ingredients that make it so effective . For example, the compound in Neem, Azadirachtin, disrupts the metamorphosis of insect larvae. So by inhibiting molting, Neem keeps the larvae from developing and they die without producing a new generation. Azadirachtin is so repulsive to insects that they would rather starve to death than touch anything with traces of neem. Another neem compound is called salannin and it’s equally as effective of a repellent. In a few studies, it’s even been proven even more effective at repelling biting insects than those repellents containing the chemical concoction of DEET. Neem also has many moisturizing properties and helps get rid of excess dryness and scaling. It helps soothe irritated skin. The anti-bacterial properties of neem prevent development of any further skin infection. Because Diatomaceous Earth can by very drying, Neem helps protect your pet from excess dry skin. Yarrow’s most ancient use and most famous use in the herbal medicine world is as a natural wound healer. It’s also considered a sacred herb by many cultures around the world because of it’s healing ability. Yarrow is a wonderful anti-inflammatory for skin conditions and soothes irritated skin. It is also anti-microbial and has pain relieving properties. Because pets with fleas tend to get secondary infections from flea bites, Yarrow protects your pet from those secondary infections and also helps soothe red, irritated skin. Mix all ingredients together and put in a shaker top container. I used a mason jar with a shaker top lid (I got my mason jar shaker top lid at Christmas Tree Shop, but you could make your own by drilling holes in a regular mason jar lid). Apply from head to tail along your pets spine in dry conditions. Brush your pets fur going the opposite direction so the powder comes in contact with the skin. Avoid the eyes and nose. Rub the powder on the belly and legs. Try to get the flea powder on as much skin as you can. I have found that brushing the fur in the opposite direction and applying the flea powder with a cosmetic puff (like THIS) works really well. I also found the fleas seem to like the tail, the area right above the tail and the belly/groin area so I made sure to pay extra attention to those areas to get them well covered. How often to apply flea powder? To use this as a general repellent (with no serious flea infestation), applying once a month during active flea season (end of spring/summer) is sufficient. If the pet gets a bath or gets wet, it will need to be reapplied. You will need to apply more often, depending on how bad of an infestation you are dealing with. I applied every other day until I saw no more traces of fleas (now I’m just using it as maintenance). Some are successful with applying as little as once a week, but others need it more often – it just depends on the level of infestation. Also remember to reapply if your pet gets wet (important!). If you have a flea infestation, you will also need to apply this flea powder to your floors, windowsills, door sills, pet bedding, sofa, etc. Focus your efforts where your pet spends the most amount of time, since fleas and their eggs will be the most concentrated in those areas. Just apply a light dusting to the areas in your house and leave it there overnight. Vacuum in the morning or sometime the next day. Do this once a week for 4 weeks if you have a flea infestation. This flea powder works amazingly, BUT, it will not work overnight if you have a flea infestation. You must be diligent about applying it to your pet AND applying the powder to your home and vacuuming at least once per week for 4 weeks in a row to get rid of an infestation. You can even use this flea powder it in your yard to repel and kill fleas, ticks, spiders, ants, mosquitos, etc! I also leave a little bit of this flea powder in my door and window sills to prevent spiders, ants and other bugs from entering. Based on my research and the advice of my holistic vet friend, I’ve learned some really great tips and other options about how to get rid of fleas naturally, including a few options that are holistic vet recommended that you can purchase if you are not a do it yourself-er. That is covered in PART 2 that you can read HERE (this post was already long enough ). End Note: Is Diatomaceous Earth safe? Somewhere along the line, a rumor was started that Food Grade Diatomaceous Earth was harmful to your lungs if breathed in. This is true for Crystallized or Filter Grade Diatomaceous Earth where it can cause a disease called silicoses if breathed in for very long periods of time. But this is NOT true for food grade Diatomaceous Earth, which we are using (it’s very important to make sure your DE is FOOD GRADE!). Food grade DE is processed and shaped differently than crystallized diatomaceous earth and is not harmful to pets or people. Food grade DE is recognized as safe for animal and human use, safe for consumption and even safe for those pregnant and nursing. Like any dusty product, you probably want to wear a dust mask if you will be breathing it in for a long period of time such as when dusting your yard. Has your pet ever had fleas? What worked for you? Have you tried any natural options before? Let us all know!